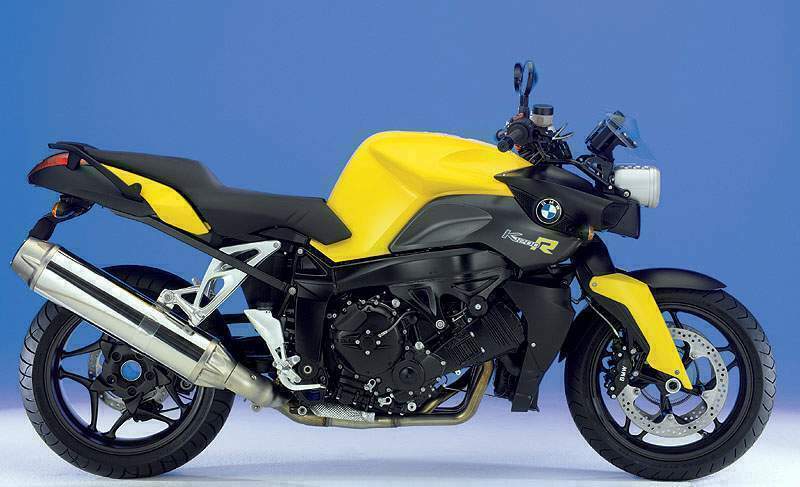 Just when you thought the growing "naked bike" segment - sportbikes shorn of their plastic wrappers, unveiled for all to see - was all about showing off and nothing about substance and style, here comes the 2006 BMW K 1200 R. Unlike the weightlifter who can barely scratch his own back, the K 1200 R is powerfully built yet agile, massively quick yet perfectly docile for those times you want to take it easy. It's the ideal combination of menace and class. BMW has taken advantage of the incredible technology housed in the new K 1200 S - a straight-line speed machine that also accelerates, turns and stops like a truly modern superbike - to create the K 1200 R. In fact, except for revised bodywork and ergonomics, the two bikes are very much alike. And yet the two motorcycles couldn't be further in temperament. The K 1200 S is sophisticated, urbane, while the K 1200 R is built for the rider who lives for sport riding and uncompromised appearances. The K 1200 R eschews full bodywork for a tidy, aerodynamically designed instrument-panel fairing that incorporates powerful asymmetrical headlights and the engine oil cooler. This is a face that performance-oriented riders won't soon forget. Nor will race fans, as the K 1200 R will form the basis for the BMW Power Cup, with races to be held all over the world on special race-prepared machines. Taking up where the popular Boxer Cup left off, it's likely that the best, hardest-fought racing in 2005 will come from the ranks of the Power Cup. Behold the most powerful production motorcycle engine BMW has ever built, the beneficiary of decades competing at the highest levels of motorsport. But it's not just about sheer thrust. Indeed, the K 1200 R's revolutionary inline-four-cylinder engine sets new standards not just for power - and, as important, excellent power delivery - but it was designed from the start to be compact and light. Moreover, its unusual configuration - the cylinder block is canted toward the front wheel by 55 degrees - not only reduces the entire motorcycle's center of gravity but also permits innovating packaging solutions. The K 1200 R's layout is as far from a me-too arrangement as you can get. Thorough development of the 1157cc, liquid-cooled engine made possible the 167-horsepower peak but is also responsible for the engine's broad, flat torque curve; although it peaks at 94 pound-feet, 80 percent of the peak torque is available from 3500 rpm all the way to the 11,000-rpm redline. That's flexibility. 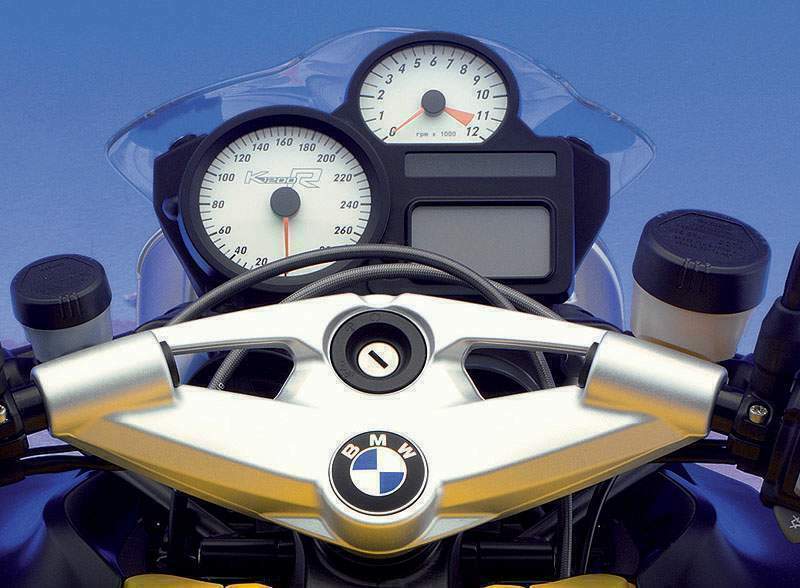 This sophisticated injection system allowed BMW's engineers to boost the K 1200 R's compression ratio to a race-like 13.0:1, which benefits not only power, but combustion efficiency as well. That gives the rider more power and torque, and increases fuel economy at the same time. Inline-four-cylinder engines have characteristic vibration but the K 1200 R powerplant uses a technology also explored in the new R 1200 Boxer engines to make it inherently smooth. Twin balance shafts are driven by a toothed belt from the crankshaft at twice the crankshaft speed and employ elastomer isolators to reduce transmission of noise and vibration. These balance shafts reduce transmission of second-order vibration from the engine to the chassis and, therefore, to the rider, who will experience four-cylinder serenity as never before. Dramatic advances in driveline technology abound in the K 1200 R. The cassette-style six-speed transmission uses stacked shafts to reduce the engine's overall length and to form the most efficient method of transferring power to the shaft final drive. The K 1200 R shares the K 1200 S's chassis components, including light-alloy main frame featuring dramatically tilted main spars - to further reduce the machine's center of gravity - made up of a selection of materials: pressure-cast aluminum, alloy extrusions and special die-cast aluminum members. Because the counterbalanced engine does not vibrate like a typical four-cylinder, it can be mounted solidly to the frame - no rubber isolators are necessary. In this way, the frame is further strengthened by the engine structure. 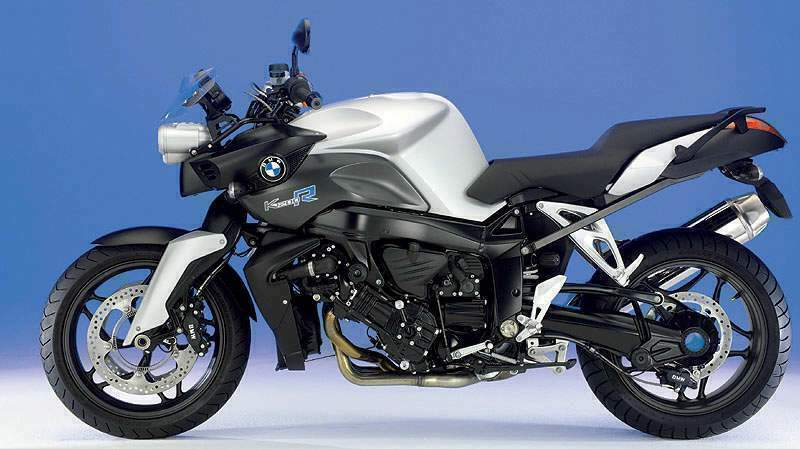 BMW has always pushed forward on suspension design, and the K 1200 R continues the tradition. Joining a revised, lightened version of the company's famed Paralever rear suspension - much lighter than conventional shaft systems and without a typical shaft's squatting tendencies - is the Duolever front suspension. Based on a concept developed by British inventor Norman Hossack in the 1980s, Duolever effectively isolates suspension movement from steering forces for smooth handling. Moreover, Duolever has significantly less friction than conventional telescopic forks, so its action is much more supple while also being given spring and damping rates appropriate for a sportbike. Finally, the Duolever has been designed to provide effective anti-dive control so that the K 1200 R remains on an even keel during hard braking. And it's not just the suspension design that breaks new ground, either. As with the K 1200 S, the K 1200 R features BMW's ESA - Electronic Suspension Adjustment - as an option. Accessed through the instrument panel display, ESA sets spring and damping rates electronically. The rider can choose three combined spring settings - solo, solo with luggage or rider with passenger and luggage - along with three damping modes: comfort, normal or sport. The spring settings must be adjusted at a standstill, but the damping adjustments can be made while underway. BMW's acclaimed EVO brake system is standard on the K 1200 S. Integral ABS is available as an option. Disc diameters in front are 320mm with a single 265mm disc at the rear. 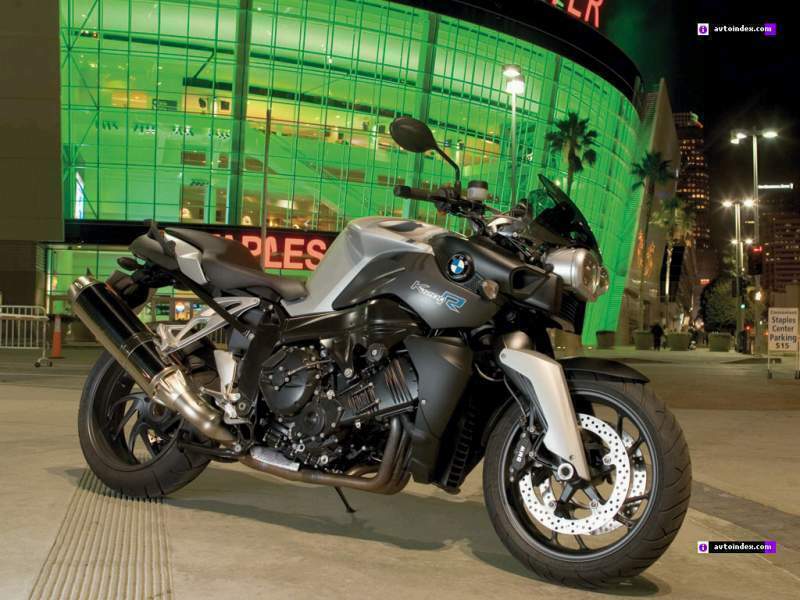 The K 1200 S includes BMW's Partial-Integral adaptive braking system. Both brakes -- front and rear -- are activated whenever the rider pulls the handlebar-mounted lever, but only the rear brake is activated by the foot pedal. BMW has continued to develop the EVO ABS system and for the K 1200 S, the technology has been refined once again to take full advantage of the bike's peerless sporting performance. These powerful brakes work through new-design wheels that are light yet strong. They carry traditional sportbike-sized tires - a 120/70ZR17 in front and a large-footprint 180/55ZR17 at the rear.